Inside: Are you ready to manage your anxiety? Did you know journal prompts can help you manage your anxiety? This is an often overlooked practice for helping decrease anxiety! Are you looking for some ways to help you overcome your anxiety from a Biblical standpoint? Do you get tired of the endless googling of new ideas and remedies to quiet your anxious mind? I don’t know about you, but the thought of writing or journaling would often time cause anxiety for me. It sounded complicated and time-consuming. What I’ve realized is when I got my feelings out on paper, somehow seeing them decreased their effects on me. I can be completely honest when I inscribed it onto paper. Ridiculously honest. Many times, I can see the irrationality of my thoughts when I see them on paper. Getting into this habit of pen on paper causes me to work through my anxiety on a regular basis. I don’t stuff it down and never deal with it, but rather work it out frequently. When I see what my emotions are telling me, I can refute the lies and mistruth and incorporate God’s truths instead. Can I reassure you that anxiety affects about 40 million people? Women are at greater risk to suffer from anxiety than men. Anxiety is more than worry. Most common mental illness in the United States. When we see these statistics, they can be concerning and frustrating. As a mom, the idea I can pass this to my children makes me sad. As a Christian, I want you to know: You aren’t alone and there is hope. God’s word is full of ways to help control and alleviate anxiety and stress. He can use this anxiety to draw you closer to Him, create a compassionate heart for others and He can use you in the midst of your anxiety. I’ve created these journal prompts to help you manage your anxiety, thoughts, and emotions because God wants you to live victoriously. How to write out your anxieties and feelings. Why you should focus on the blessings in your life. What you can do when you’re anxious. How journaling helps manage anxiety. What your greatest fears are. 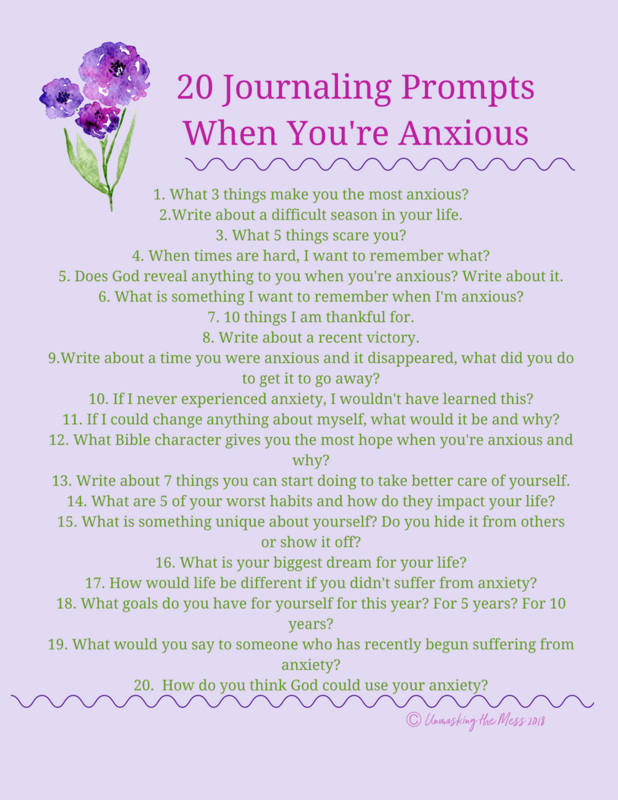 The “20 Journal Prompts When You’re Anxious” will be delivered to your inbox and I’ve included a few other anxiety-related emails to that will come through the course of 10 days, so you can take the time and work through these prompts! While you wait for the first email, want to check out our Best Biblical Resources for Anxiety? Change won’t happen until we intentionally make the time to actually manage our anxiety.